Anyone who knows me knows that I am obsessed with all things robot. If my house was full of nothing but robots and I slept in a giant robo-bed, I could die a happy man. But since that will never happen (sigh), I will have to settle for these awesome key toppers from Perpetual Kid. 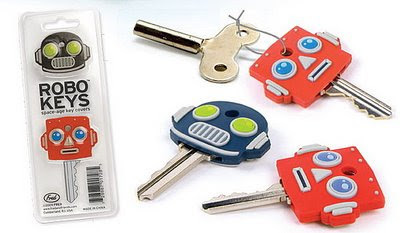 While they aren't for sale yet, you can bet that they will be gracing the keys that allow access to my robo-house as soon as they are.